There is a school of thought which argues that Western ideals of beauty are based in symmetry and perfection, whilst in the East, aesthetic value can be found in the damaged or imperfect. 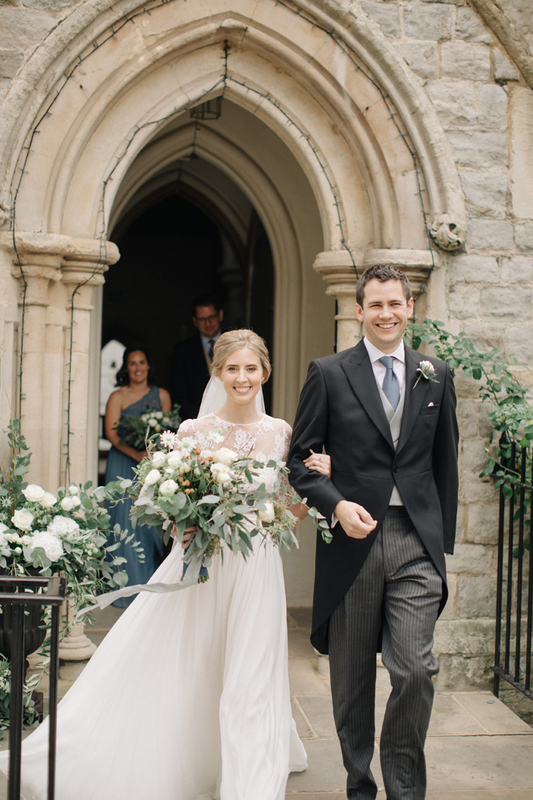 For this particular wedding day, we were asked to create florals for our perfectly named couple Emily and Emile, who wanted beauty conveyed in an utterly imperfect way! 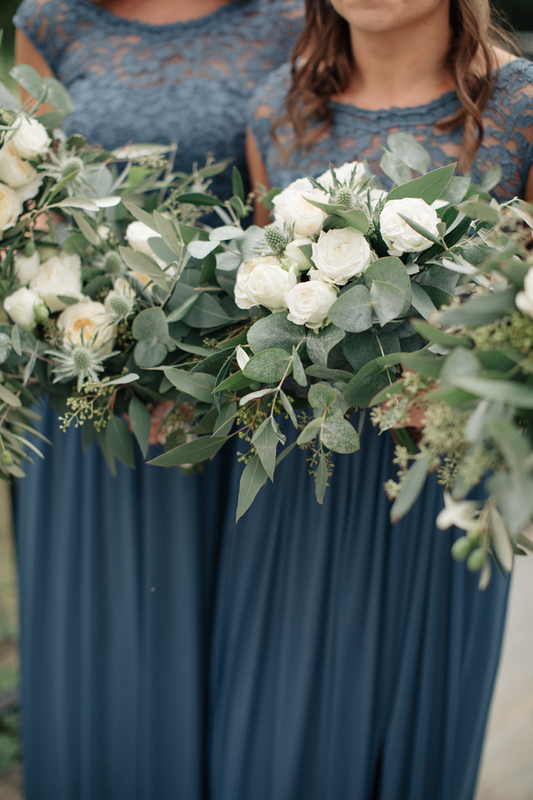 Not only did our clients eschew typically ‘perfect’ flowers, they were also into the aesthetic of broken things. To clarify, Emily and Emile are great admirers of the ancient and very beautiful Japanese art of Kintsugi. 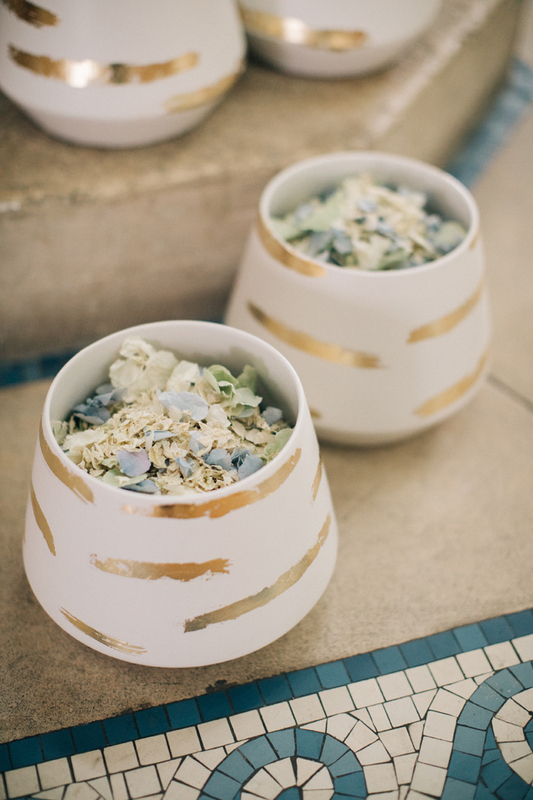 Kintsugi, which literally means ‘golden joinery’, is the art of repairing broken pottery with lacquer which has been mixed with powdered gold, silver or platinum. 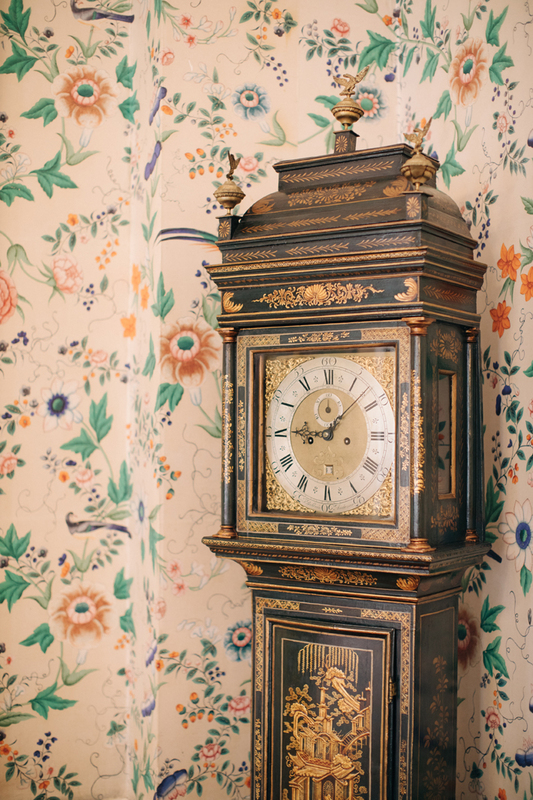 Dating back to the 15th Century, it has evolved into an art form by which utterly unique and beautiful objects are created from once broken pieces. In promoting repair as an intrinsic part of an object’s history, Kintsugi has become a metaphor and philosophy for life: for some it demonstrates human resilience and how we as people develop from negative experiences, taking the best from them and owning them, which in turn makes each of us who we are. 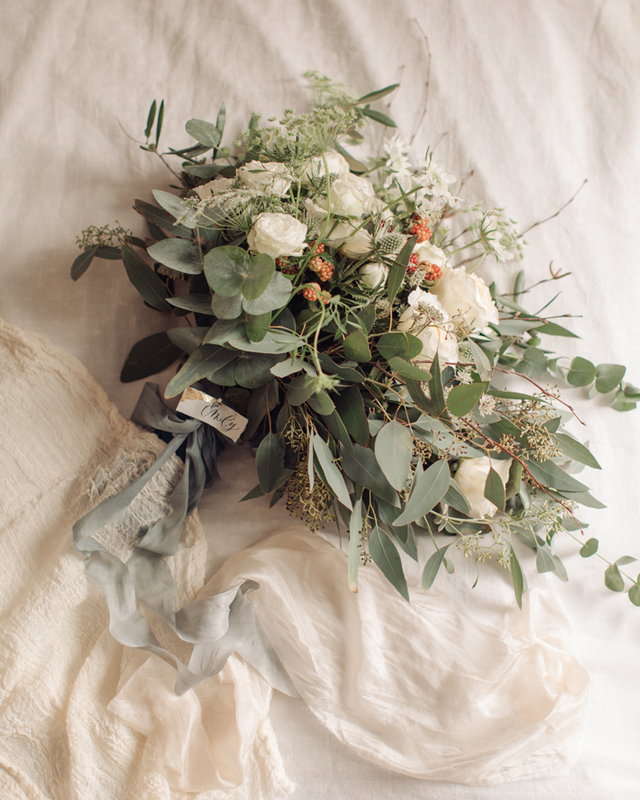 And with this in mind, our challenge; should we choose to accept it, was to piece together a very relaxed look, with simple, unassuming flowers but in a very careful, impeccable way. 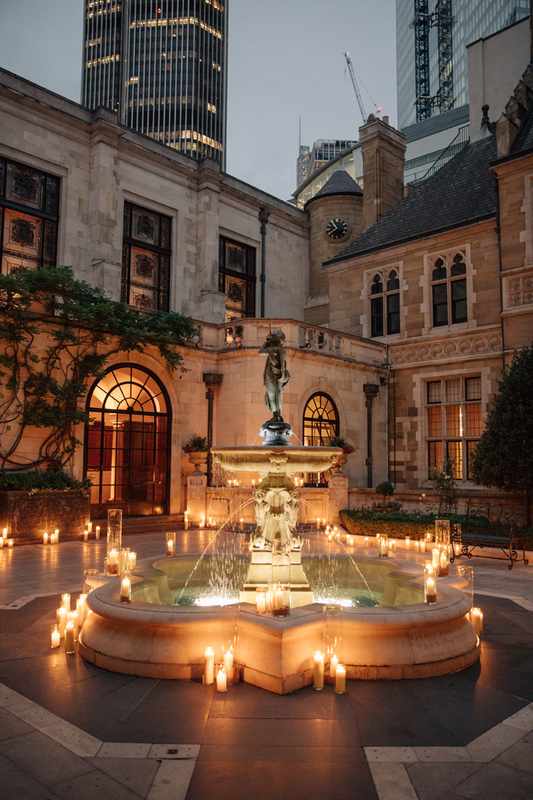 We would need to incorporate wild, rambling natural foliage into very formal and historic London buildings: St John’s Church in Notting Hill and Merchant Taylors Hall in the City. 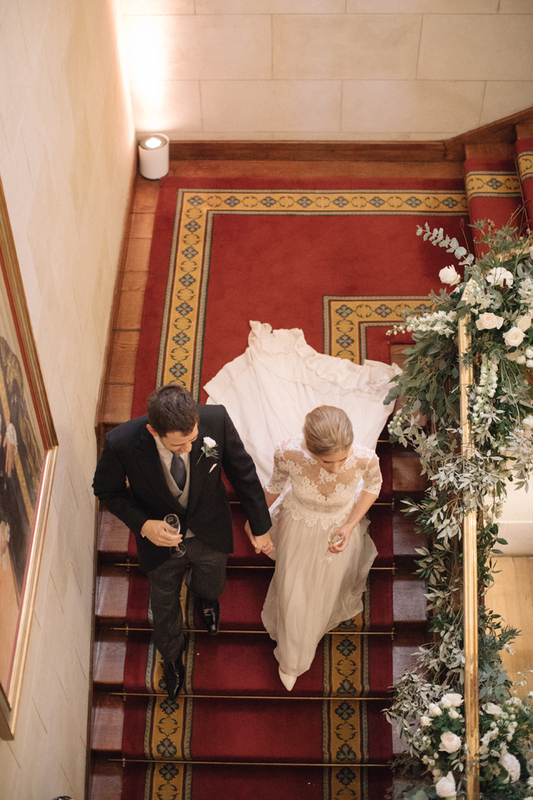 Our clients wanted us to make everything look effortless and unaffected, whilst at the same time paying every attention to detail. We briefed the team that the look was to be disordered, but that we need to be meticulous about how we created it! 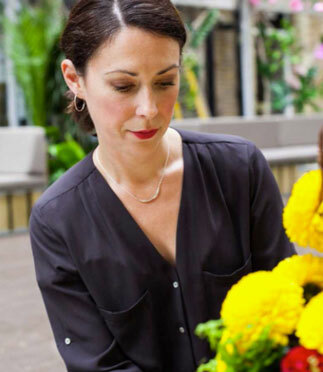 We agreed to avoid using typical ‘flower-shop’ flowers –so no dahlia, tightly spiralled roses or trendy succulents – and turned our eye to using branches, foliage and simple, elegant flowers that could hold their own without shouting ‘everyone look at me!”. 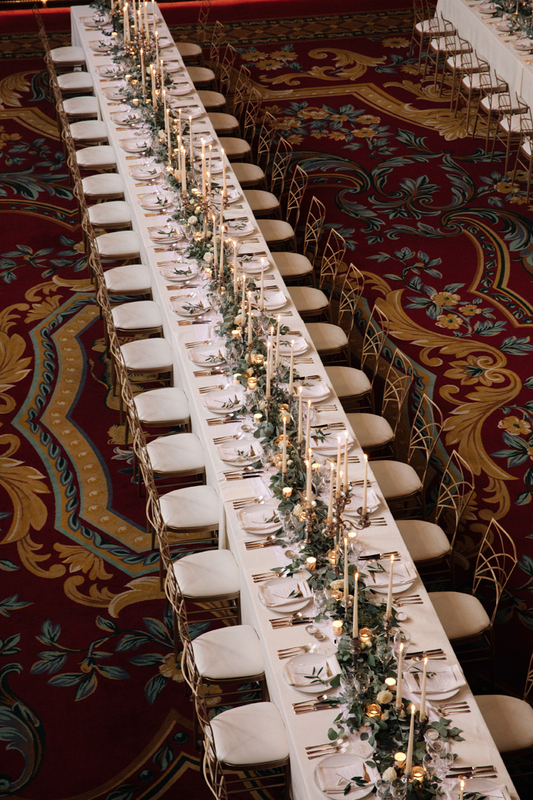 Through the usage of symbolic thistles and olive, our floral designs were to look very natural and gratifying. September is the perfect time of year for wild looking late summer flowers. 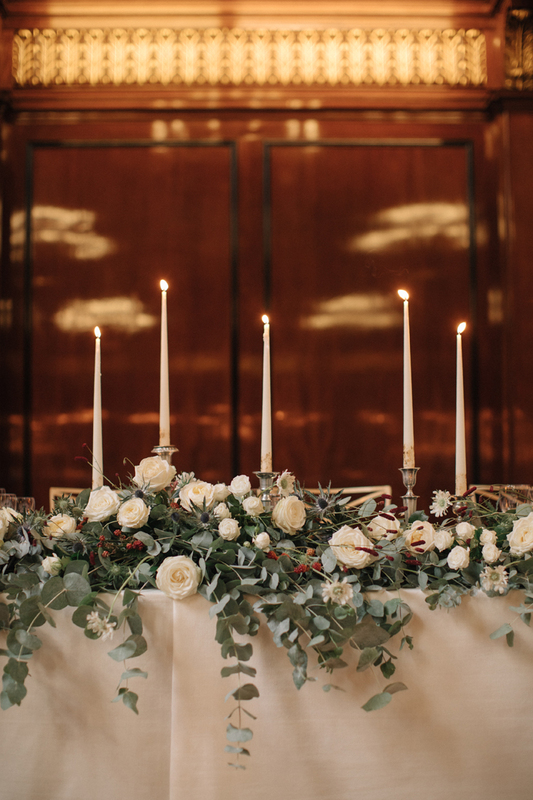 Using a floral palette of white, along with touches of red and blue to complement the venue interiors, we incorporated masses of stunning eucalyptus with lots, and lots, of candlelight. 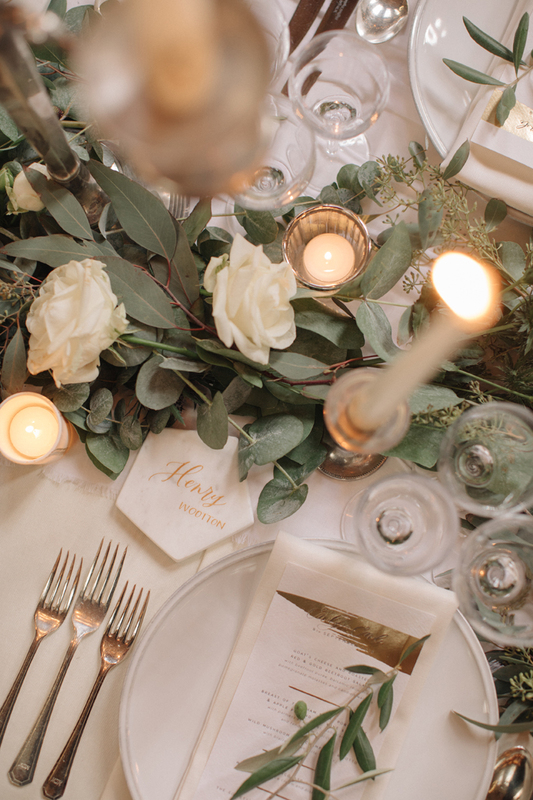 We worked with wedding planner extraordinaire Knot and Pop to create a beautiful look for the bridal party, ceremony and reception. 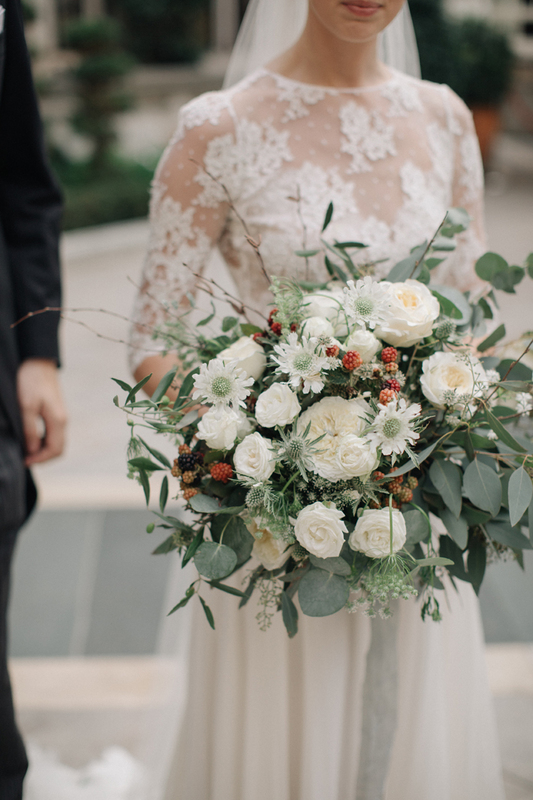 A loose and flowing bouquet for the bride was made from eucalyptus, dill, the most heavenly mix of garden roses and white scabiosa and astrantia, together with thistle, wild blackberries and twigs. 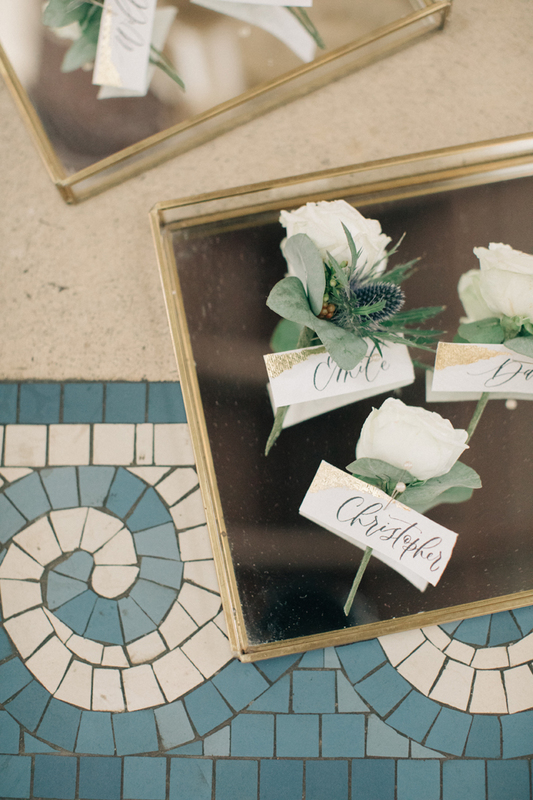 The simple, delicate and timeless button holes for the gentlemen were made from the roses and thistle for Emile. 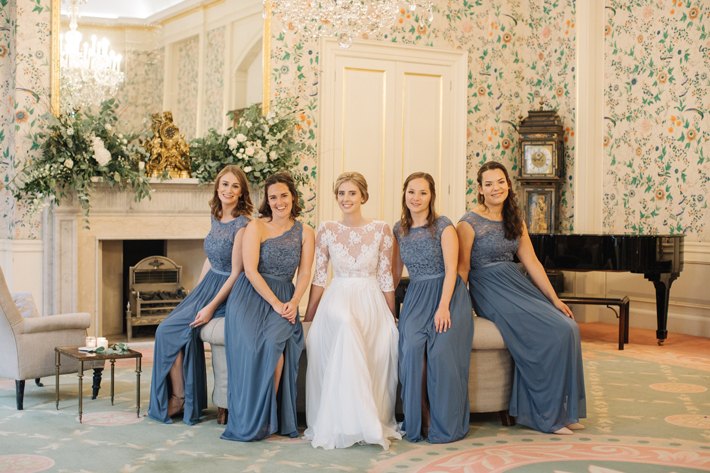 With the cool tones of blue found in the thistle highlighting the stunning bridesmaids’ dresses and the tiles of the St John’s Church, the look for the ceremony was one of pure elegance. 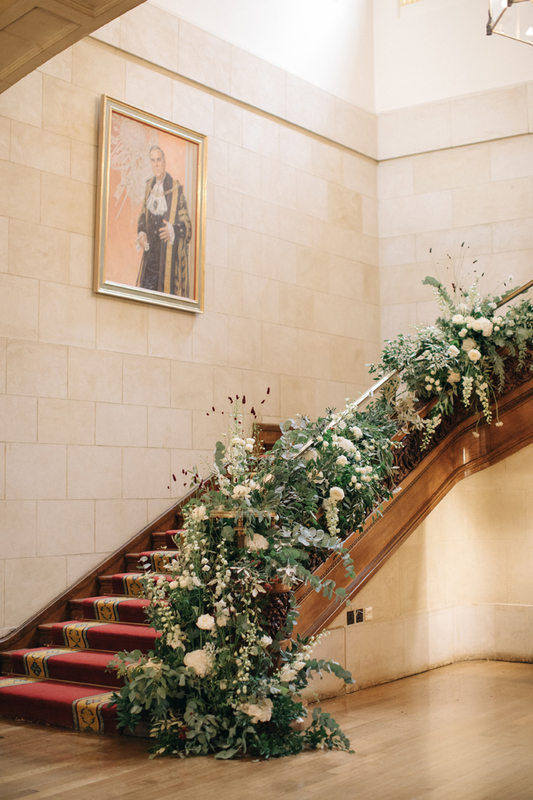 For Merchant Taylors’ Hall we created a feature entrance design to look as if it were growing around the formal grand stair-case. 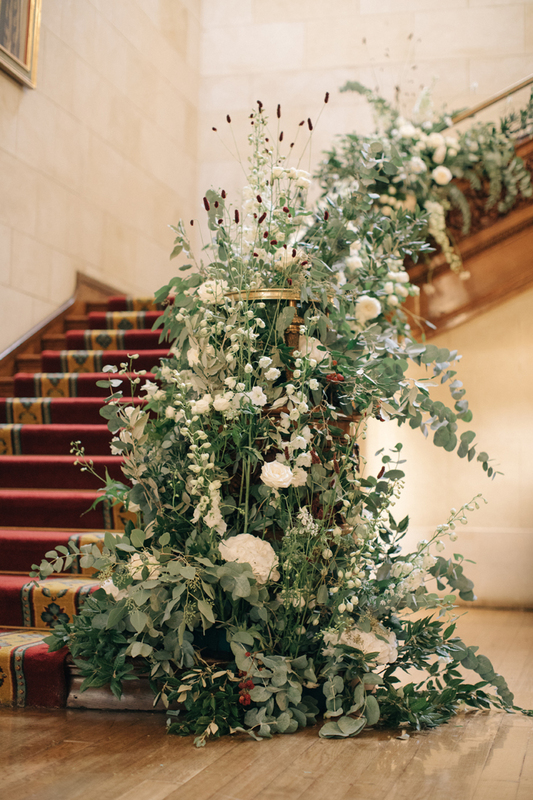 Simple white delphinium, hydrangeas, grass-like red sanguisorba, garden roses, blackberries, eucalyptus, olive and ruscus all combined to compliment this stunning historical hall. 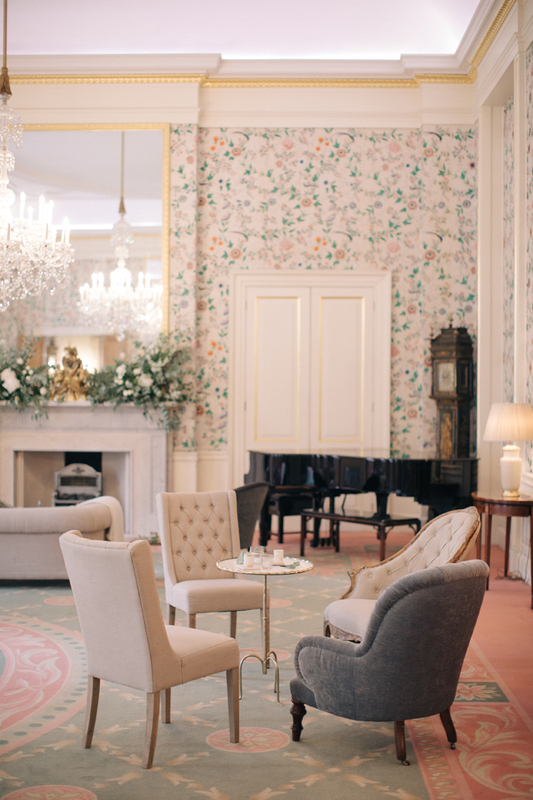 The Parlour, with its 18th Century original Chinese wallpaper, was simply dressed with a rambling, but not over-the-top, mantel design of matching flowers which perfectly complimented the collection of elegant furniture. 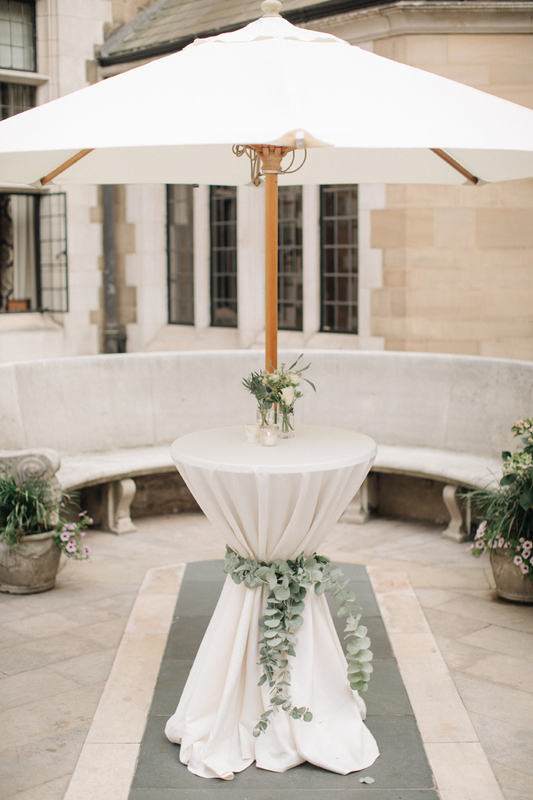 The courtyard, a hidden gem within the City of London, was beautifully set with white dressed drinks tables tied with swags of foliage and dressed with a smattering of key flowers. 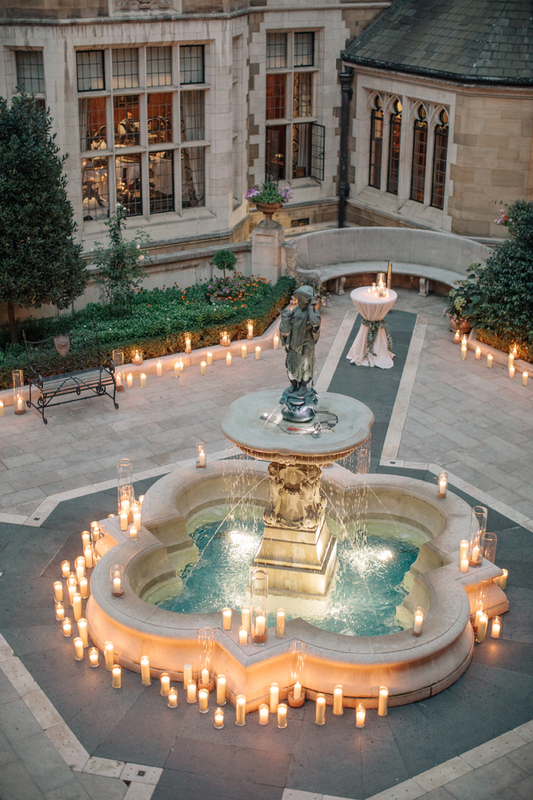 Later in the evening the courtyard became alive with the dancing, flickering flames and shadows from candles which combined to create an atmospheric and befittingly romantic space. 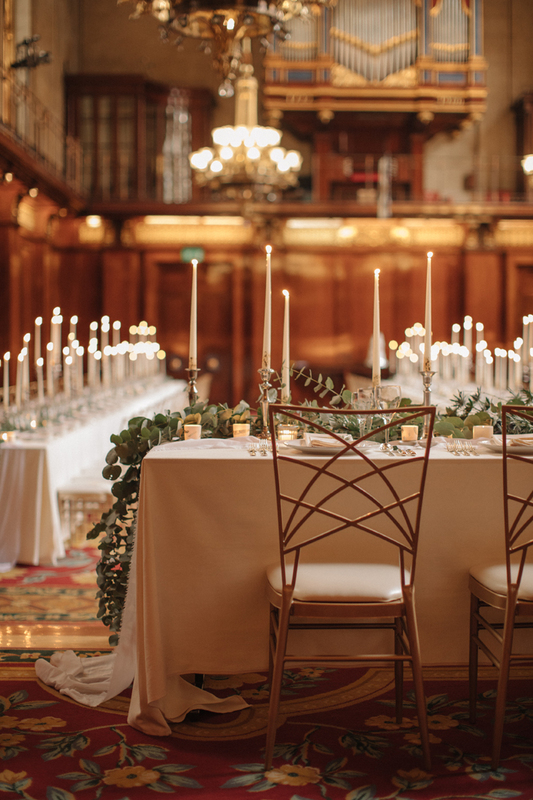 Rambling eucalyptus and olive garlands were laid along the stunning guest tables in the Great Hall, interspersed with blown roses, blue thistle and deep red juicy blackberries. 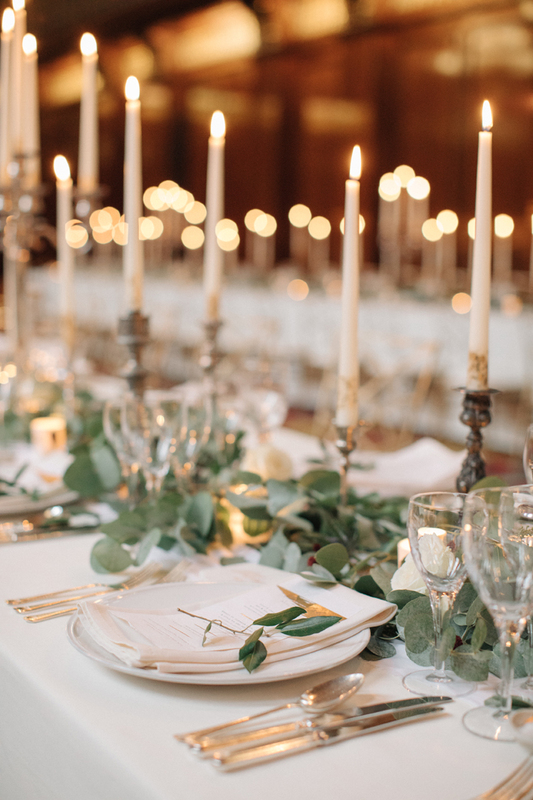 The nodding seed-like heads of sanguisorba and scabiosa were entwined amongst lots and lots of candlesticks and perfectly set tapered candles. 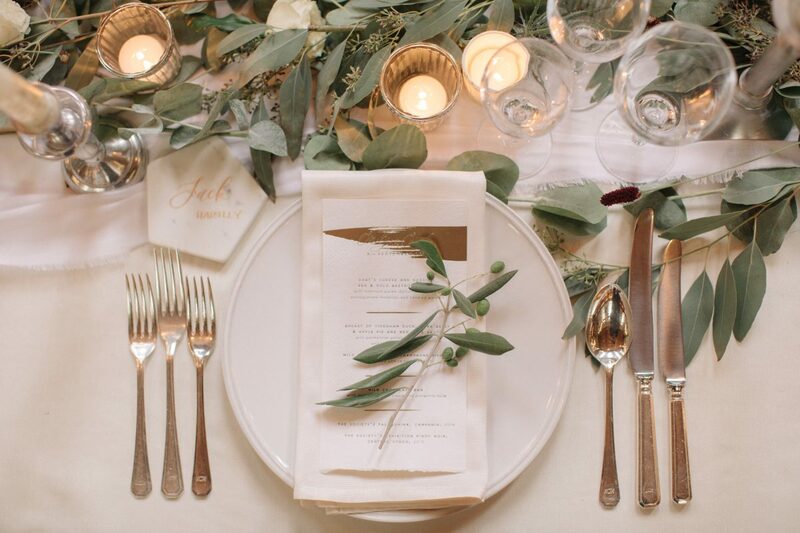 No detail was missed from the perfectly positioned tables, the stunning dining chairs and exquisite place settings which were styled by Susie at Knot and Pop. And as for that reference to the beautiful art of Kintsugi? 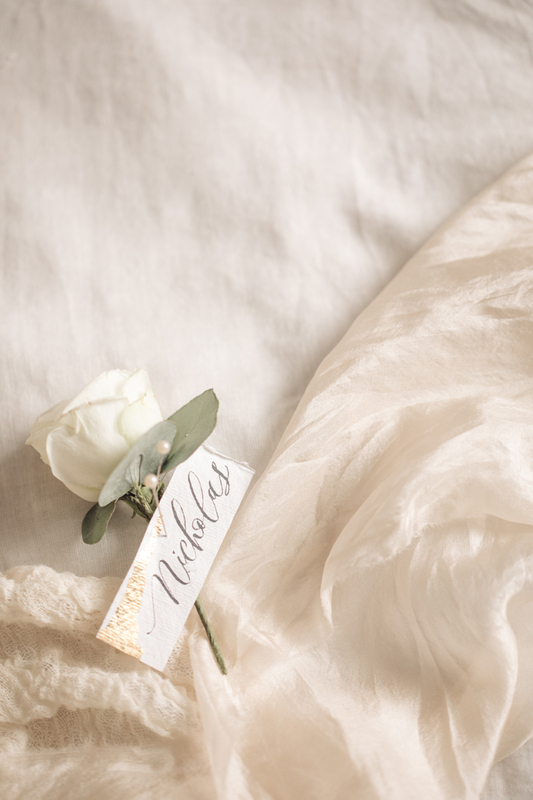 Well, everything that Susie touched that day, definitely received a dusting of gold!